This opal, worth over a million dollars, which catches all the light around it and sends it back to onlooking eyes in a blazing rainbow, is a Belemnite “pipe” that was once a kind of cuttlefish skeleton, and was found in 2007 by one John Dunstand, who had been searching and mining for opals for more than half a century in the deserts of Coober Pedy, Australia. 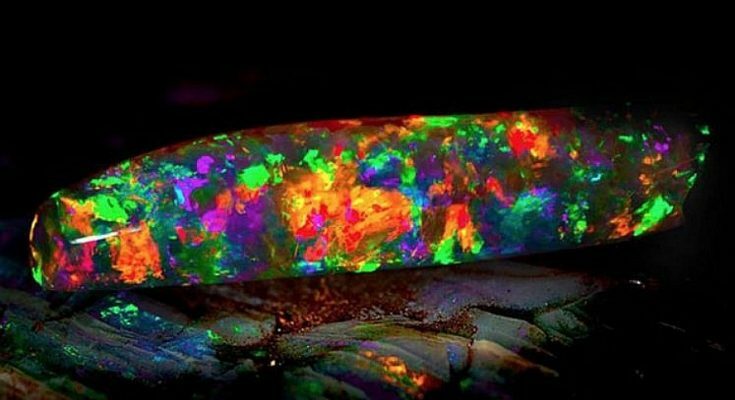 He was searching in an old mineshaft in that area with an excavator, when he noticed the colors of the Rainbow Opal, half still burried in the sandstone around it. The “Virgin Rainbow opal” is currently on display in the South Australian Museum opal exhibition in Adelaide, and the photo is by South Australian Museum. The stone is currently up for auction.